How often have you wished for an investment strategy that bridged the gap between the stock market and fixed-yield investments? Covered call writing is that strategy. It offers much of the upside potential of equities with less volatility and provides investors the flexibility to tailor the risk-reward trade-off to their individual needs. Returns of 10 to 15 percent per year in conservative accounts--and as much as 20 or 40 percent per year in more aggressive accounts--are possible. But there are also caveats that investors must understand before implementing this strategy. In this pioneering, easy-to-understand book, leading options experts Rick Lehman and Larry McMillan give a complete guide to covered call writing and the increased control and lowered risk it affords. They detail the basics and beyond, from the mechanics of implementation to developing strategies that are best suited to your investment goals. Covered call writing as it can be practiced by any stockowner does not require huge minimums, margin accounts, or advanced theoretical analysis. It can be implemented in a retirement account as well as in investment or speculative accounts. However, it is a strategy that to date, at least, has been practiced by only a devoted few. New Insights on Covered Call Writing shows how to use this powerful and accessible investment technique--giving you the edge to enhance your returns and lower your risk. "This book makes a great case for basic reading and writing--reading stock charts and writing covered calls." "This was a definite eye-opener, and one of the soundest approaches to stock investing I’ve seen. It makes you wonder what else Wall Street has been keeping from us." "In a low-return, high-volatility environment, these strategies can boost returns and lower risk. There is no such thing as a free lunch, but in this case all the lunch costs is a little initiative." "This book has the most complete and comprehensive coverage of covered call investing that I have seen. 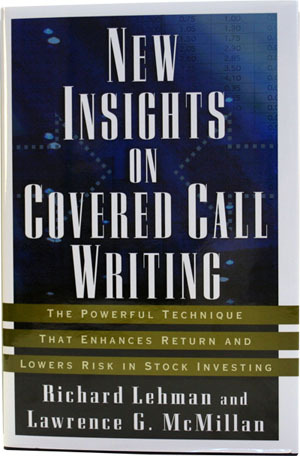 Most books discuss covered calls as just one of many option techniques. This book goes the extra mile. It discusses the theoretical aspects of covered calls and also provides the practical tools any investor would need to effectively implement a covered call trading strategy." Ernie Zerenner - President, Power Financial Group, Inc.
Richard Lehman has more than twenty-five years of experience applying his expertise in options strategies. He has held executive positions at E.F. Hutton, Thomson McKinnon Securities, First Saxonia Securities, and at the New York Stock Exchange.